If a change is made outside Mountee, in the ExpressionEngine control panel for example, it won’t be reflected on your Mountee drive until you reconnect. If you’re working on a team you can easily step on each others toes. 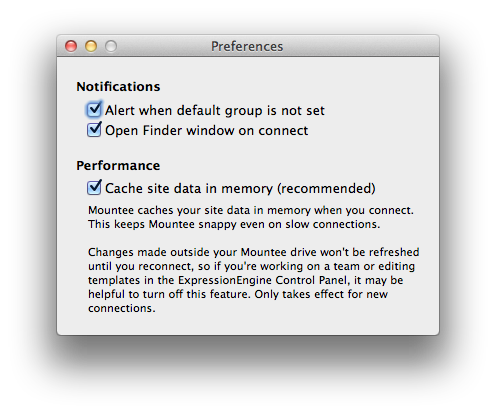 If you’d like to turn off this caching feature, open preferences and uncheck the “Cache site data in memory” box. This applies to all connections made after you make the change, so you will need to reconnect any currently connected sites to change the behaviour.